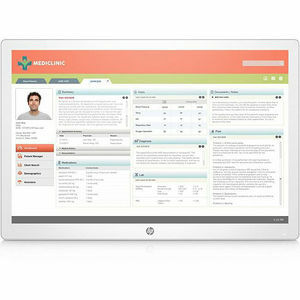 Deploy a display optimized for patient rooms, nurses stations, medical carts, and public areas with the HP Healthcare Edition HC241. It is built for easy, repeatable sanitization after every patient engagement and is DICOM Part 14 compliant for accurate viewing of medical images. Help ensure accurate, consistent image viewing between healthcare professionals and for patient consultations and image verification with a DICOM Part 14 compliant display. See more and scroll less on the WUXGA 24-inch diagonal screen.